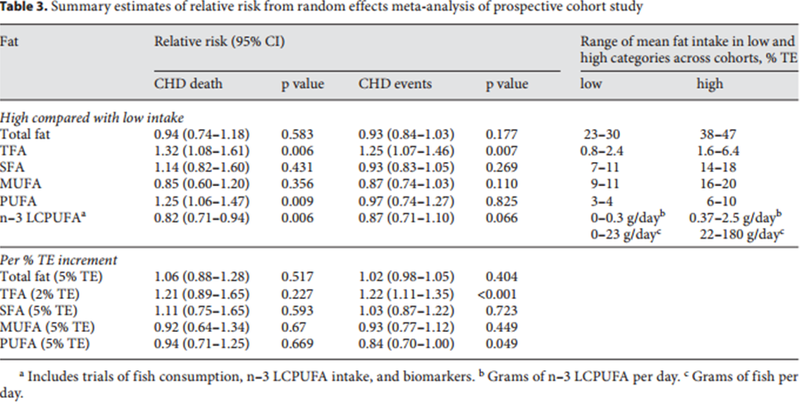 The Jakobsen, et al meta-analysis included 11 cohort studies (4-10 years of follow up) with a total of 344,696 people, 5249 CHD events and 2155 CHD deaths. The hazard ratios (HR) come from substitution models to see the whether replacing 5% of calories from SFA with MUFA, PUFA or carbohydrate (CHO) is associated with CHD (taken from data in table 2). See figure 1 for the plots on the individual studies. The Mente, et al meta-analysis used the used the Bradford Hill criteria to “derive a causation score based on 4 criteria (strength, consistency, temporality, and coherence)”, see table 1. “A score of 4 was considered strong evidence of a cause-and-effect relationship between the dietary exposure and disease. A score of 3 was deemed to indicate moderate evidence of causation. A score of 2 or less was considered a reflection of weak evidence of causation”. They pooled the results of many observational studies looking at a large variety of dietary factors and these results can be seen in table 2. The RRs came from comparing the highest quintile/quartile with the lowest. Dietary fat and coronary heart disease: summary of evidence from prospective cohort and randomised controlled trials. 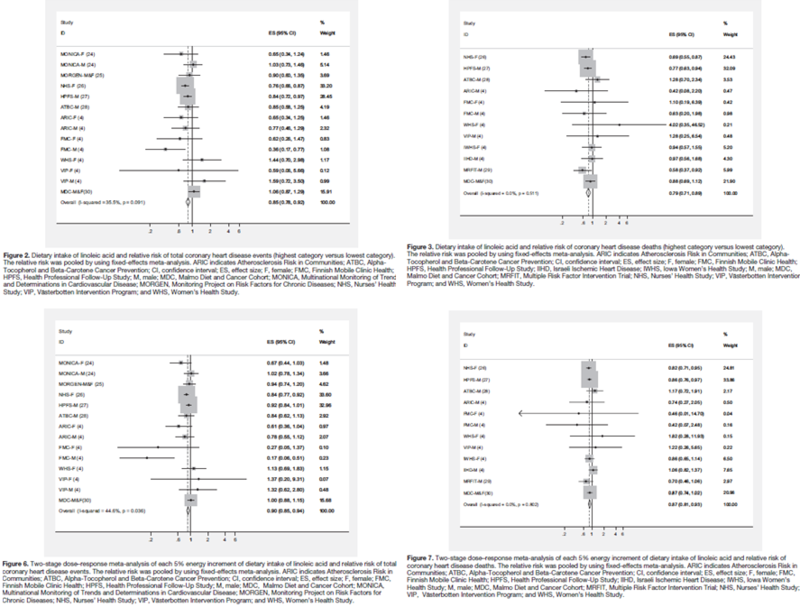 The Skeaff & Miller meta-analysis pooled studies that compared the highest vs. lowest quintile/quartile and those with 1% and 5% increments in calorie intake from SFA. The summary for all fats is presented below in table 3. The forest plots for the SFA analysis are presented in the paper table 6, 7 and 8 (paper is open access). They found SFA was not significantly associated with CHD events or CHD mortality. 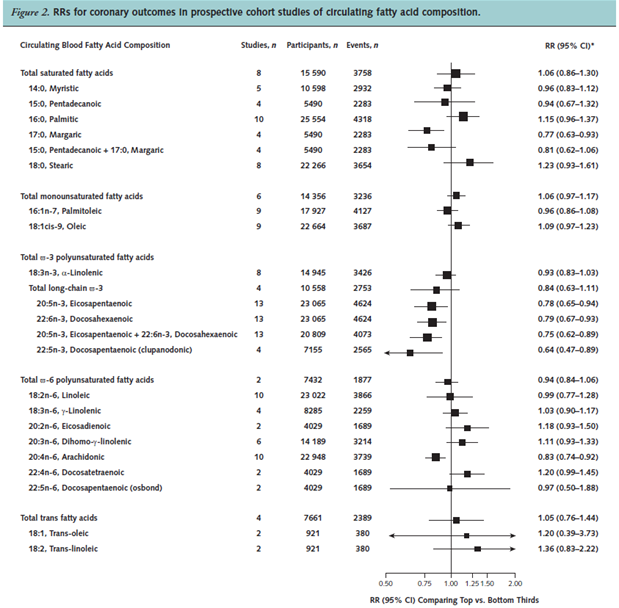 Dietary linoleic acid and risk of coronary heart disease: a systematic review and meta-analysis of prospective cohort studies. 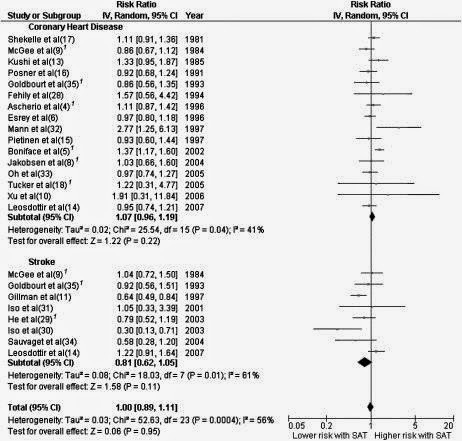 In summary, all the meta-analyses agree that SFA isn’t significantly associated with CHD. 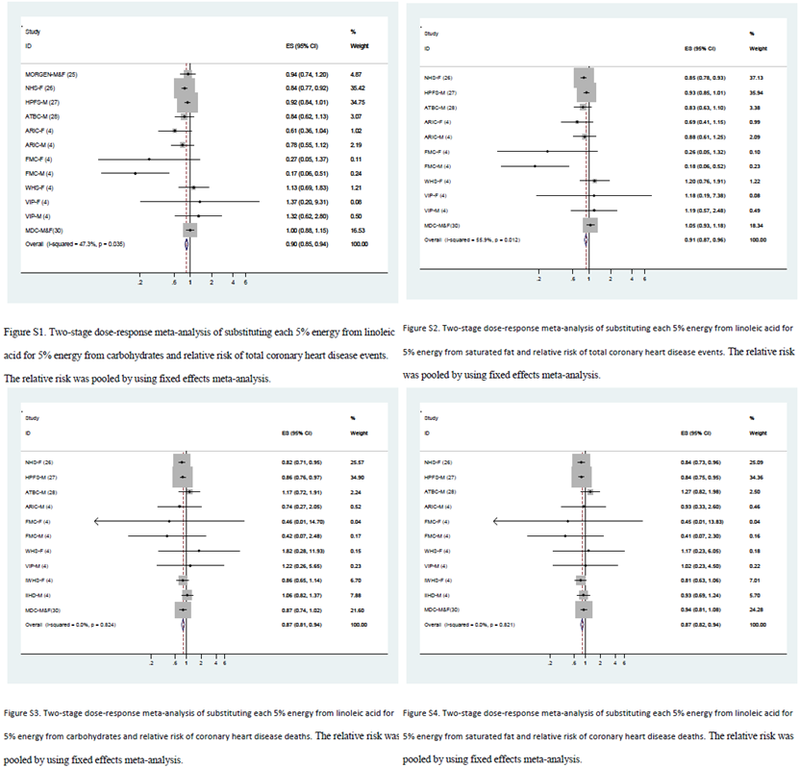 The Jakobsen and Farvid meta-analyses found that replacing 5% of total calories from SFA with PUFA (which means almost halving current SFA intake and almost doubling current PUFA intake) would reduce both CHD events and CHD mortality, but the replacement doesn't seem to be specific for SFA and appears to be an independent effect of PUFA. These meta-analyses, even Jakobsen and Farvid, should not be used to argue that SFA are toxic (etc) as you must then come to the conclusion that MUFA (particularly in Jakobsen) and carbohydrate are equally as toxic (which is pretty rediculous). Great summary of the important meta studies. Last year's paper on linoleic acid from Harvard spells it out - PUFA is equally protective, association wise, whether it replaces SFA or CHO. MUFA too when they calculate that. So this is a non specific effect of PUFA, which is both scarcer and essential. It doesn't affect total mortality, and the effect of increases can't really be predicted because the average intake (in NZ) s 5% and few people would eat 10%E. Keys noted that 3-7% was the normal human range of PUFA and this was too low to influence cholesterol levels, which were mainly reflecting SFA. Thus the lipid hypothesis doesn't explain anything. Thanks. I just added that paper. I agree, despite repeated claims that SFA is toxic (which to Harvard’s credit they don’t seem to do as much of), the only evidence against SFA is really just pro-PUFA. Steven, do you have the appendices for that Mente review? Yea, I requested them from the authors sometime ago but they never replied. Anyway, nice post as usual. You're right, I should try again. Thanks.